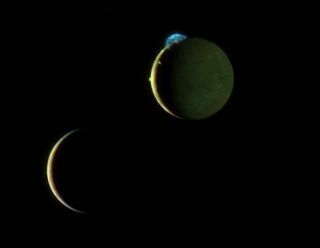 This composite image of Jupiter's moons Io (top right) and Europa shows three volcanic plumes on Io's surface, the largest 190 miles (300 kilometers) high. Two smaller plumes are also visible on the edge of the disk and along the illuminated border. Something strange is happening on Io: The Jupiter moon's vigorous volcanoes are mysteriously offset from where scientists expected, and its underground magma oceans may be the cause. A new model suggests that worlds caught in an intense push and pull of gravity, like the volcanic moon Io, are likely to have below-ground oceans of magma or water that stick around for a long time — in the water's case, providing a potential hotspot for the development of life. Jupiter's moon Io is the most volcanically active body in the solar system. Its hundreds of volcanoes are caused by heat coming from the gravitational push and pull between Jupiter and the nearby moon Europa. The coming and going of Europa as it orbits, and Jupiter's steady influence, pulls Io into an oval orbit and flexes it, creating heat inside the moon due to friction. Earlier models of the process envisioned a solid, claylike Io changing shape under the gravitational influence, but they had a strange flaw: the volcanoes were predicted to form over the spots with the greatest internal heating, but on the real Io the volcanoes form much farther east. When the discrepancy was published, in 2013, the researchers wrote that the moon might be rotating faster than expected or have a spongy magma ocean. "It's hard to explain the regular pattern we see in so many volcanoes, all shifting in the same direction, using just our classical solid-body tidal heating models," Wade Henning, a co-author on the study and also from University of Maryland and NASA Goddard, said in the statement. This new model, published by a team including the lead author of the 2013 paper, considers the added effects of an ocean layer below the surface of the moon formed with a mixture of molten and solid rock. The molten rock would swirl and rub against the solid rock under gravity's influence and generate additional heat, the researchers said. The combination of these fluid effects, plus the flexing solid material, could explain the observed volcano patterns. "The fluid tidal heating component of a hybrid model best explains the equatorial preference of volcanic activity and the eastward shift in volcano concentrations, while simultaneous solid-body tidal heating in the deep-mantle could explain the existence of volcanoes at high latitudes," Henning said. "Both solid and fluid tidal activity generate conditions that favor each other's existence, such that previous studies might have only been half the story for Io." While an underground magma ocean is certainly inhospitable, other moons in the solar system have liquid water seas below the surface, like icy Europa and Saturn's moon Enceladus, which are considered possible habitats for life. This new model suggests that liquid oceans might stick around for longer and also be more common beneath tidally stressed satellite surfaces. With energy sources and raw materials available, a long-lasting liquid water ocean could be a good place for life to develop. Such oceans could begin to resonate with the push and pull of gravity, generating heat through tidal flow and lasting for a long time, said Christopher Hamilton, a co-author on the study from the University of Arizona, Tucson. "Therefore the mystery may be not how such subsurface oceans could survive, but how they could perish," he said. "Consequently, subsurface oceans within Io and other satellites could be even more common than what we've been able to observe so far." The research was detailed in June in the Astrophysical Journal Supplement Series.